We proud our self to provide you with the most effective cockroach removal in Bondi and the surrounding areas. When it come to cockroach pest control removal, Attack pest control Sydney use the highest quality smell free chemicals, which is 100% safe for kids and pets. Entry: Cockroaches can enter your home in many different ways, from the outside through cracks and crevices, vents, sewer and drain pipes. We even bring them in on products like grocery bags, boxes, purses and in person! Within three to seven days after mating, cockroach females produce egg cases known as oothecae. Each ootheca contains approximately 15 embryos. Adult females produce between six and 14 oothecae in one lifetime. After carrying the egg case on the tip of her abdomen for hours to a couple of days, the female deposits it in a hidden location. It adheres to the surface of its new location through the female’s saliva. Under good conditions and optimal temperatures, immature cockroaches, also known as nymphs, will emerge within 24 to 38 days. As they grow, nymphs undergo metamorphosis. They do this by shedding their exoskeleton. By the time they are adult roaches, this will happen 10 to 13 times. At each molt, they appear more and more like adults. After undergoing their final molt, they are equipped with wings and reproductive capabilities. This process spans between six months to over a year. cockroaches live for approximately one year. 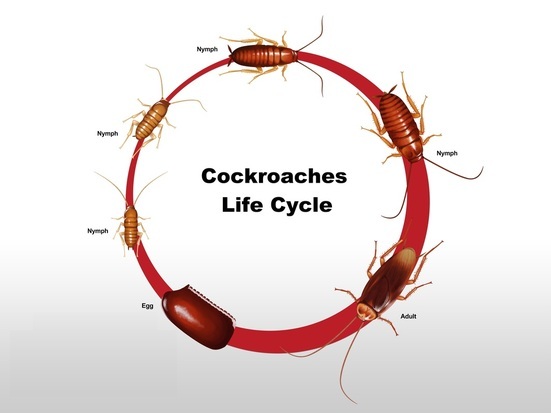 The length of the cockroach’s life is dependent upon environment, diet and other conditions. Favorable conditions lead to rapid population growth, while unfavorable conditions cause adult cockroaches to develop more slowly or to die prematurely. Spray all inside home around skirting.